Hello everyone!!! 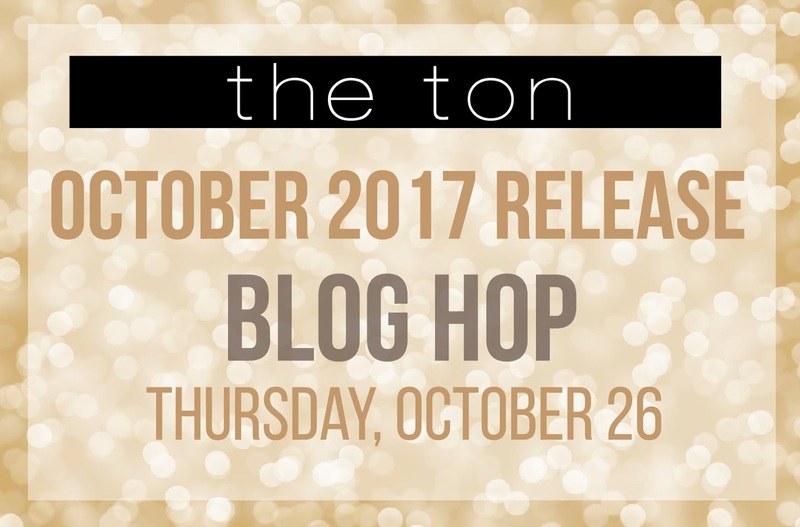 Are you enjoying The Ton's October 2017 Release Blog Hop? If you arrived here from Brenda's blog, you are right on track. If you want to start from the beginning of the hop, please hop over to The Ton's blog. 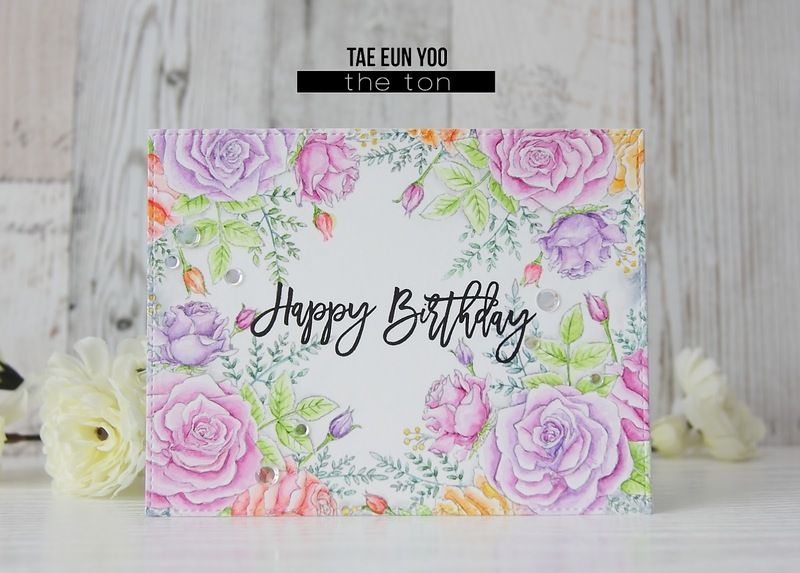 The Ton has released 11 gorgeous stamp sets and coordinating dies in this month which are available in The Ton's shop. 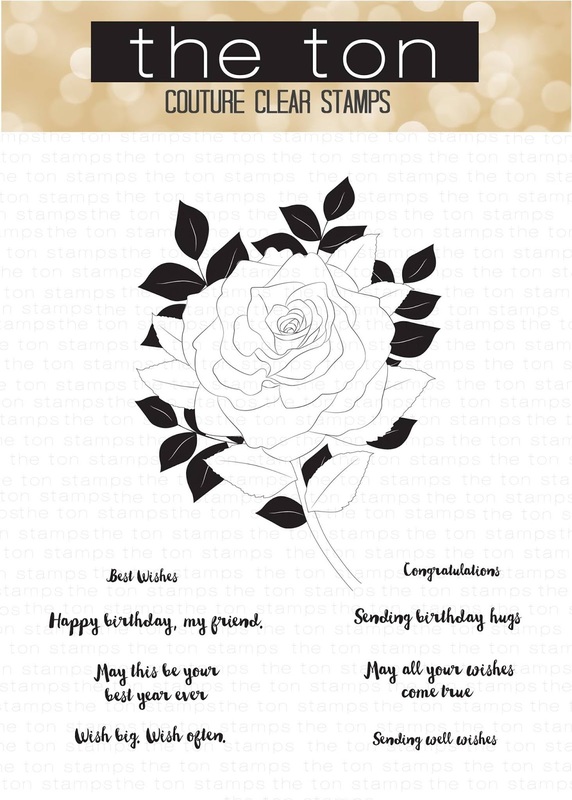 Our design team member EunJi is designing digital stamps and some of her designs were used for this release. I shared some of them already on my previous posts. If you want to take a look at them, click here, here and here. 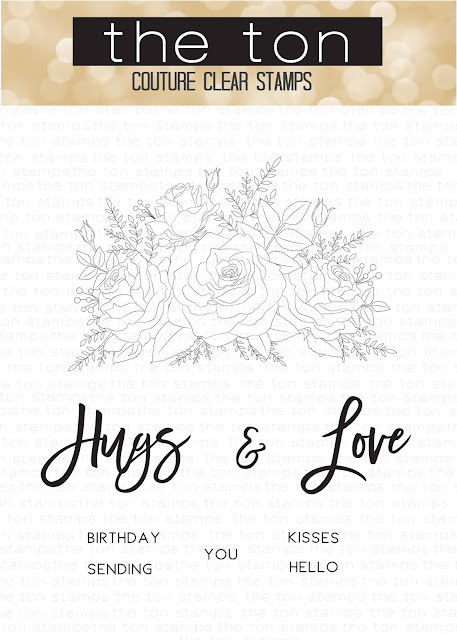 Today I want to share my projects featuring Tulip Bouquet, Wishful Rose and Country Rose Cluster stamp sets. 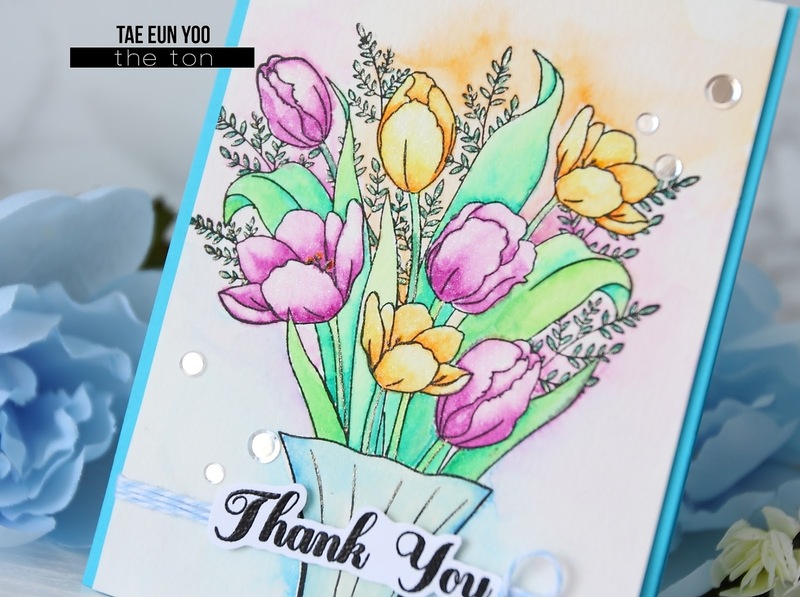 For my first card I watercolored Tulip Bouquet in the vase. I usually do no-line coloring when I color flowers on my cards. But this time I tried to color black outlined image. 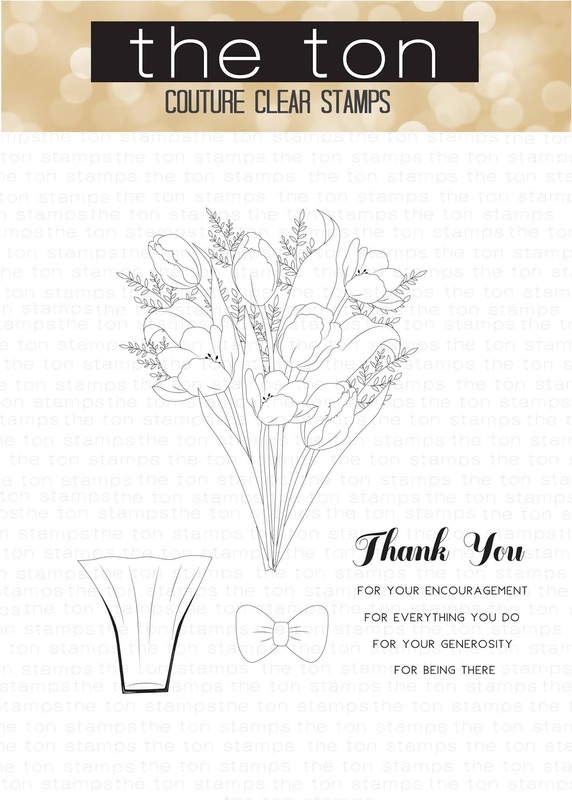 I stamped the vase and the Tulip Bouquet in black archival ink and colored it. I did loose watercoloring using wet on wet coloring technique. I narrowed down the colored panel and foam mounted it on the light blue cardbase. I added white-blue bakers twine with a bow and the sentiment on the front panel. The sentiment stamped in Noir is from Tulip Bouquet as well. I clear heat embossed the sentiment and fussy cut it. 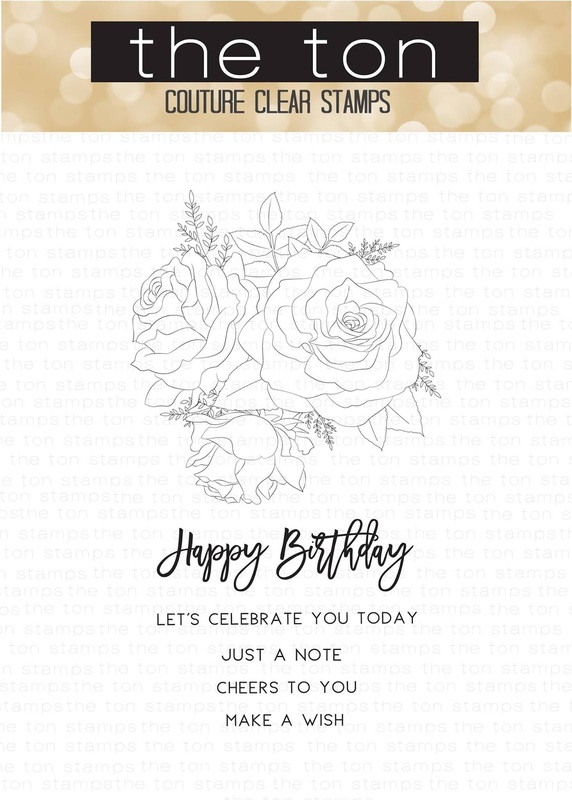 I added some Glass Slippers round Confetti to finish off the card. My second card is featuring Wishful Rose. I planned to color a blue rose with Copic markers. So I stamped it in light blue ink on a Neenah Solar white panel. I colored the Wishful Rose with Copic markers. To keep the image mainly in blue I used bluegreen colors for the leaves. I then colored the image again with Polychromos colored pencils to add details. On the solid leaves around the image I added gray. After done with coloring I cut the panel along a curved line and the outline of the image and rounded a corner to mount it on a dark gray cardbase with some foam adhesive. The sentiment was white heat embossed on the cardbase. To finish off I scattered some sequins from Smoked Emerald and Blue Lagoon Couture mix. For my next card I used Country Rose Cluster. The sentiment is from Celebration Rose Cluster. I stamped the Country Rose Cluster on each corner of my watercolor paper panel to create a rose border. I used here a gray archival ink. After I stamped the Country Rose Cluster in gray archival ink on the watercolor paper, I watercolored them mainly in pink and purple. I added a bit of yellow and orange on some of the roses. After done with coloring I cut the panel using Double Stitched Rectangle die. The sentiment from Celebration Rose Cluster was stamped in Noir. I mounted the panel on a white cardbase and glued some Glass Slippers round Confetti to finish off the card. That's it from my side! Hope you enjoyed looking my cards today! For our hop, we have a shipping discount for domestic orders. Our shipping promo ends on November 1 at 11:59pm. This promotion does not apply to prior purchases. The threshold amount is calculated before taxes and shipping. For U.S. orders, receive free shipping on orders over $75. Use code "USOCT17" at checkout. The next stop is Jenny's blog! She has awesome projects to share with you! Below is the complete hop list! Tae Eun - It's me :)! WOW! Your cards are amazing! Awesome coloring! Wow! All three cards are beautiful, but that blue and gray is striking! 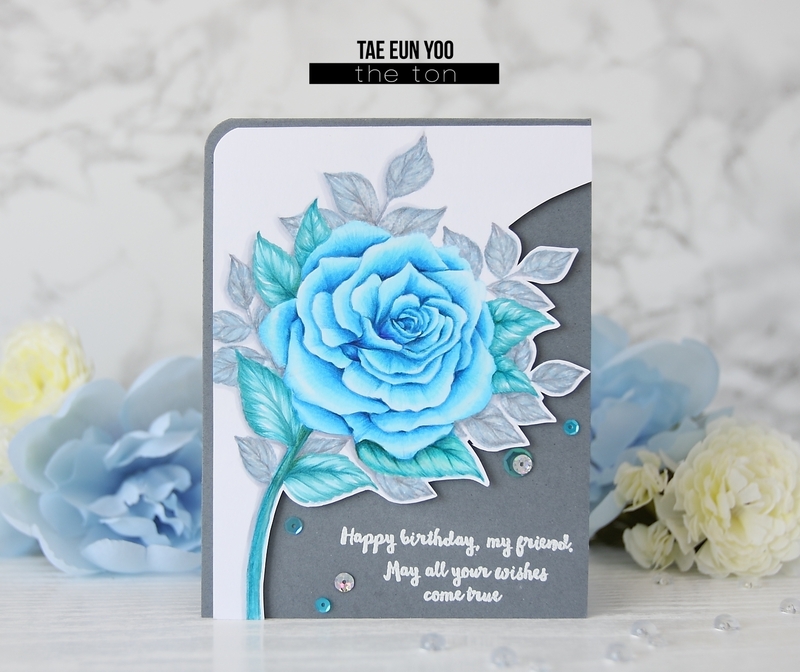 All of these cards are amazing but the blue rose on gray is simply stunning. As expected, your cards are absolutely beautiful! Thanks for the inspiration!! Lovely cards. All 3 are stunning but the blue rose on gray is stunning. I loved the curve feature on the rose panel. It really accents the blue rose against the gray background. All three of your cards are gorgeous. You created truly beautiful cards. Love the colors in all 3 beautiful cards! 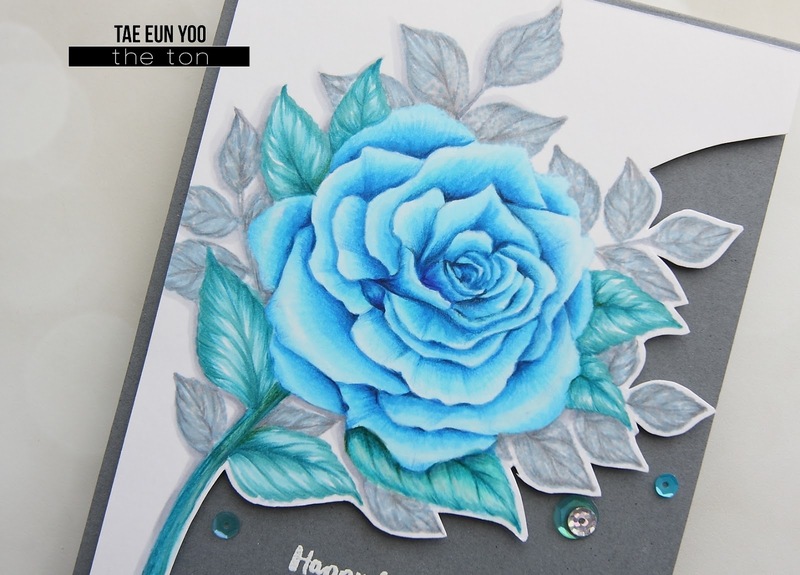 That’s a really different and nice design for the blue rose card! 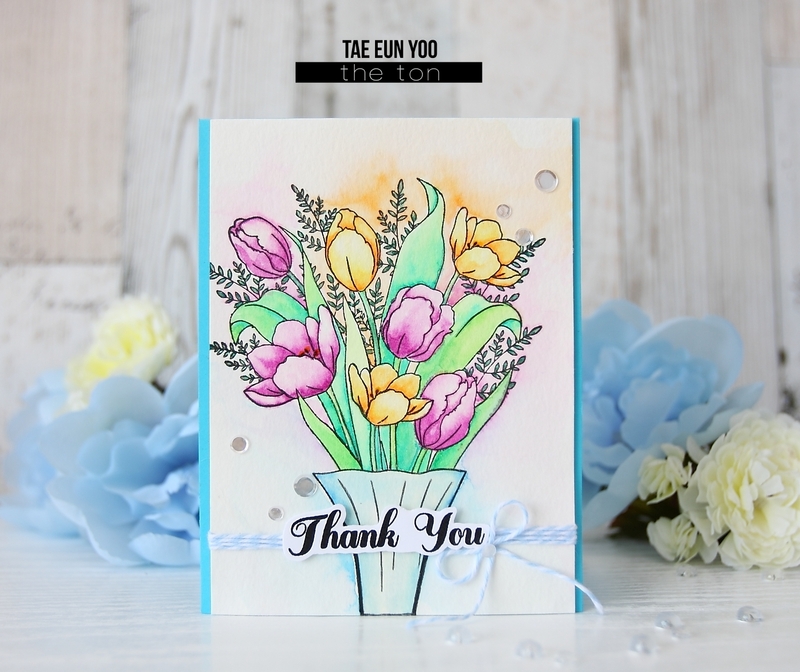 fantastic trio of cards, Tae Eun - beautiful coloring and love the design of the blue rose card! Wow Wow Wow! Fantastic! Love the watercolouring and the no-line coloring. I've just signed up as your follower. Beautiful cards! Stunning work just simply amazing, I am in AWE! 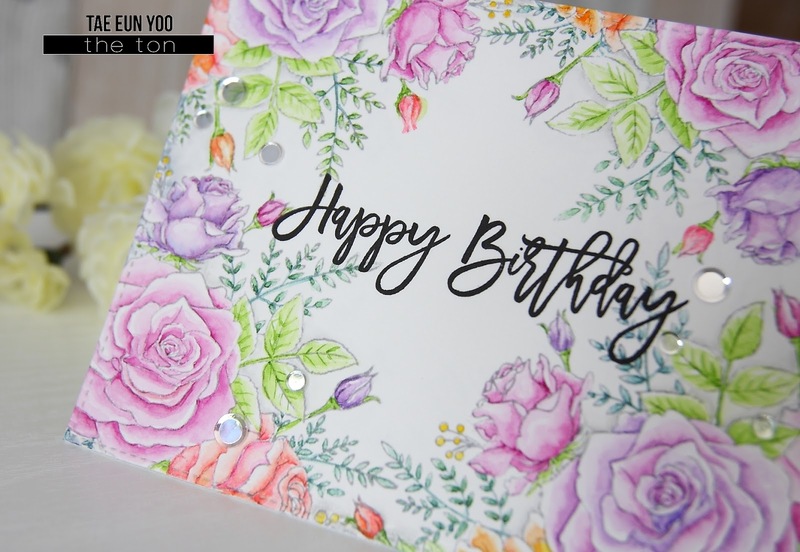 Gorgeous & stunning cards!!!! Thanks for sharing your inspiration! Oh my goodness !! Your cards are truly amazing !! The choice of colors along with the coloring gives such a wonderful result. What a beautiful set of cards. I want all these stamps! All three are beautiful, but that last birthday card is extraordinary! Your cards are so beautiful!! Such pretty coloring and the designs are stunning. Absolutely stunning cards! You make the flowers look so real with your great coloring. Stunningly beautiful! Gorgeous coloring on each one! 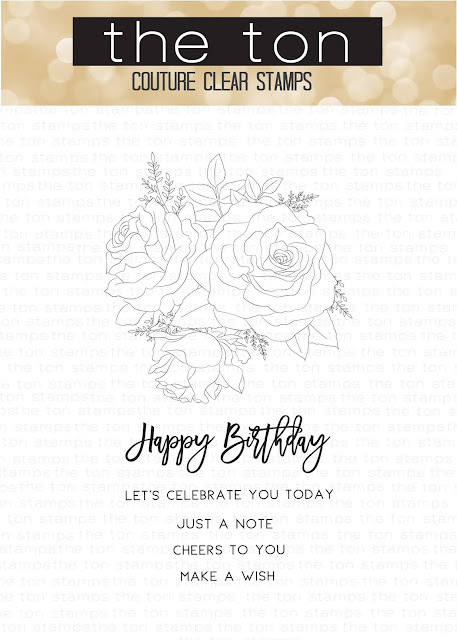 The 'happy birthday' card is fabulous! What a beautiful selection of cards, all of them are amazing! I think I like the second one most, but it's a hard choice between these gorgeous creations! Absolutely stunning cards! Love how you partially cut the panel on the 2nd one and the 3rd card is just so beautifully (& perfectly!) colored. Such pretty colors. What a great cards, the two with the roses are my favorites! Great design! Incredible, as always! Tom was sitting with me last evening when I received this feed... I showed him my favorite here is what he said: wow! looks 3D! Your cards are beautiful, love those colored pencils, will be checking them out. Oh my!!! Awesome cards!!! Colouring of your second one take my breath away!!! The blue Rose is my favorite simply beautiful. Thank you for sharing. Yes, it is an awesome blog hop. 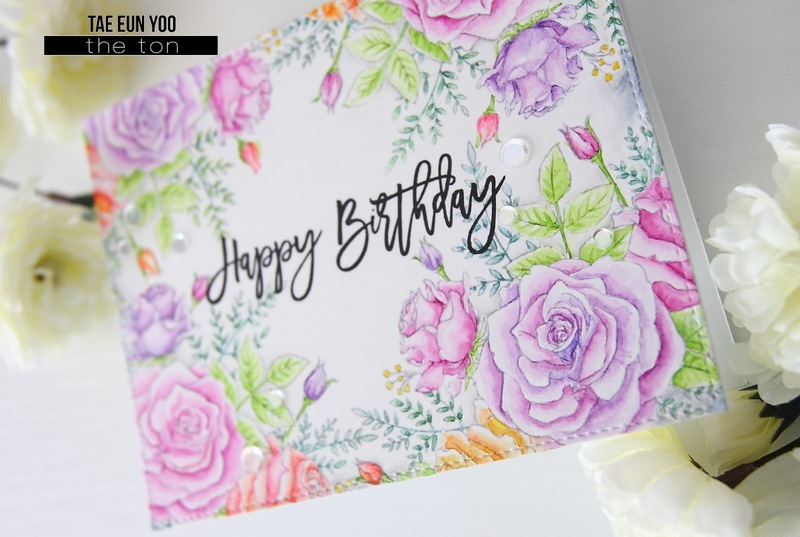 Gorgeous floral cards - love the colors. Beautiful cards. I especially love the Country Rose card. Such pretty colors on these floral cards. Wow your colouring is out of this world! Beautiful crations! Oh, my word! Your talent is beyond words! Thank you for sharing! Wow these are so spectacular. I just love your watercoloring. Thanks so much for the inspiration. Gorgeous blue Wishful Rose!! Copic markers and Polychromos colored pencils to add details just a marvellous idea! Your work is stunning! I love the blue rose, so striking! wow...your use of colour is just fantastic!! just such amazing colouring mf. Very nice article. I enjoyed reading your post. very nice share. I want to twit this to my followers. Thanks !. If you need Mobile Application Development Services Riyadh then visit us! and thanks again for post.